There’s definitely an art to successfully selling products online. And if you haven’t done it before, you will face a huge learning curve. So instead of starting from scratch, I recommend learning from someone who has done it. Russell Brunson’s DotCom Secrets is a fascinating read filled with practical advice on creating high converting sales funnels. A must read for any online marketer. Someone who has created a successful online business and can credibly explain what works and what doesn’t. One of these people is Russell Brunson, and in this review, I’m going to take a look at his book DotCom Secrets: The Underground Playbook For Growing Your Company Online. Here is what I’m going to be covering in my DotCom Secrets review. If you’re already ready to purchase DotCom Secrets, then skip down to the bottom of this review to see my $911 DotCom Secrets bonus offer before you do. While DotCom Secrets was published back in 2015, I still find that most of the strategies that Russell talks about in this book still hold true today. It contains a ton of actionable advice and if you’re looking to sell anything online, I really recommend that you grab a copy of this book and keep it as a reference. The book is only 254 pages long, and Russell has a very charming, engaging style that makes the book and easy read. He fills the pages with examples and stories of his own business, and he does a really an excellent job explaining the different “secrets” that are inside the book. At the time of this post, the book has a 4.5-star rating with more than 500 reviews on Amazon. For those of you who are not familiar with him, Russell Brunson is a highly successful online entrepreneur. He started his first business in college (selling potato gun DVDs) and he’s sold everything from shakes, t-shirts, and supplements. He co-founded Etison LLC, where they launched the hugely successful ClickFunnels software. He also created an entire ecosystem around the software which includes books (like DotCom Secrets), information products, and live events. As a result of this, he’s made over 206 millionaires who are part of his exclusive 2 Comma Club. According to Forbes, Etison, LLC is now a 360 million dollar business. And more impressively, it was entirely self-funded. While I don’t know Russell personally, he did feature one of the sites I created called DropMyLink in one of his videos a long time ago. I’ve always remembered him because of that, and he’s one of the few internet personalities I still follow to this day. To start the book Russell introduces you to the concept of the value ladder. This is a visual mapping of all the products/services you can offer to your dream client, in ascending order of price. Ideally, you would like to sell people your best, most expensive product right? But it’s unlikely someone would buy that from you if they didn’t know who you were yet. With a value ladder, you can offer something to people at a lower price point, where they are more willing to pull out their wallets. Then once you demonstrate the value you can actually provide, you’ll get a certain percentage of buyers climbing up your ladder to purchase your more expensive, but more value-packed products. Russell then introduces the concept of a sales funnel. This is the online process you need to setup to have customers ascend the levels of your value ladder. This is just a quick intro as rest of the book goes into more detail about the strategy and psychology for building out your sales funnels. The next section is all about communicating with your audience. First, Russell talks about creating an Attractive Character. This is all about coming up with an online persona that will attract people to you and help you build a following. These are your loyal fans who will be the ones to rush out to buy your products. The ability to speak in parables. Being able to share your character flaws. Russell goes into detail about each and shares several examples to help understand what he means. The second half of the chapter describes two of the most effective email marketing strategies for keeping your list engaged. The first is called the Soap Opera Sequence. Its purpose is to help you bond your new leads with your attractive character. The key idea behind this sequence is to keep each email open-ended and entertaining. By doing this your subscribers will WANT to open every one of your emails. 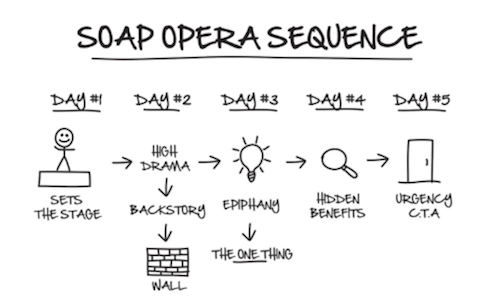 Russell shares one of the 5 email soap opera sequences that he uses, and he explains his thinking behind each email so you can adapt them to your own sequence. The next email strategy is the Daily Seinfeld Sequence. These are the emails you need to be sending to maintain your relationship with your subscribers. Because if you don’t interact with your list on a regular basis, they are going to forget about you and your future marketing efforts will decrease in effectiveness. What makes the daily Seinfeld emails work is that they are entertaining. So each email is 10% content and 90% entertainment. Start doing this and you will see your open rates, click rates, and conversations dramatically increase. The third section of DotCom Secrets is all about funnel fundamentals and the strategies behind a successful funnel. One of the important points that Russell emphasizes here is that you shouldn’t start from scratch when creating a funnel. It’s highly likely that people in your target market have already created successful sales funnels. So leverage their experience when creating your own. To do this, Russell highlights the 5 elements of any successful campaign, and he teaches you how to reverse engineer your competitor’s funnels. Next, Russell goes into the 7 phases of a funnel. One of my biggest takeaways in this section was the importance of setting up a pre-frame. To maximize your success, you need to properly set your visitor’s state of mind prior to every step of your sales funnel. To do this, you will need to know your traffic’s temperature so you can create the proper pre-frame bridge. Then you need to qualify your subscribers, buyers and your VIP buyers (the big spenders!). Understanding (and implementing) all these steps will help you get the most value possible from each subscriber, while also delivering them maximum value. The last part of this section, Russell goes over the twenty-three building blocks of a funnel. He likens creating a funnel to playing with a set of lego blocks. So creating a funnel for your business is a matter of mixing and matching the different blocks together. I found section four to be the real gem of the book. This is where Russell goes into detail about some of his best sales funnels. We learn the psychology he uses behind each funnel and how they work. Then, most helpful of all, he provides you with fill in the blank templates so you can implement each funnel for your own business. He also goes over the specific rules he uses for structuring the perfect One Time Offer (OTO). This is important because the OTO’s are where you really make the true profit from your funnel. Two Step – Free plus shipping Funnel. What I like is that these funnels are based on Russell’s own real-world experience with them. For example, the Two Step – Free plus shipping funnel is the exact same funnel he uses to sell DotCom Secrets (and ClickFunnels) himself. It’s kind of funny. He built a funnel to sell ClickFunnels, using ClickFunnels. It’s a great example of eating your own dog food. The last section of DotCom Secrets is basically a short advertisement for ClickFunnels. As mentioned earlier, it’s the software for creating the types of sales funnels that Russell has been teaching you in the book. There’s not much meat to this last section, but you can read my ClickFunnels review here for a more detailed look at how it works. Of course, the most direct way to make money with this book is to implement the strategies inside. The section on creating an Attractive Character and using Soap Opera Sequences and Seinfeld emails can be used by any online business. And if you sell anything online then implementing any of the funnels in the book will definitely improve your profits. I mentioned earlier that DotCom Secrets is part of the ClickFunnels ecosystem which has one of the best affiliate programs I’ve been a part of. Read part 1 of my ClickFunnels Affiliate Guide to see why I think so. So you can also promote DotCom Secrets as an affiliate as well. While you won’t earn any commission on the front end sale, you will cookie anyone who purchases the book through your link. And if they buy anything on the backend you will get 40% of anything they buy in the future. This is huge because you are leveraging Russell’s own funnel. It’s been time tested and you know it works. The paperback edition of DotCom Secrets is currently selling on Amazon for $11.34. Or you can pick up the Kindle edition for $8.69. However, Russell is also offering the book for free if you purchase directly from his website. You’ll just have to pay shipping and handling which comes out to $7.95. I recommend buying from his website because this allows you to see his 2-step Free plus shipping funnel in action. You get a first-hand look at how the funnel works, and the value he provides as you go through his funnel. As Russell mentions in the book, you should always try to re-engineer successful funnels, and this is a great way to do that. I really enjoyed reading DotCom Secrets. It’s filled with a bunch of aha moments, and each time I came across one I would step back and think how I could incorporate the concept into my own businesses. As Russell emphasizes, this book is a playbook. So it’s meant to be read multiple times. Read it the first time to get that initial understanding, and then start using it as a reference as you begin implementing each of the strategies. Overall, if you do any selling online, I highly recommend that you pick up a copy. I guarantee you that will learn something from it. Did my DotCom Secrets review get you interested in reading the book? I have some exclusive DotCom Secrets bonuses for anyone who picks up a copy of the book using my link. To get this DotCom Secrets bonus offer, use this link and then email me here with your receipt and I will send you the bonuses within 24 hours. Affiliate Disclaimer: I hope you liked this DotCom Secrets review. Please note that a few of the links inside this post may be affiliate links for DotCom Secrets. That means that if you click on one of the links and sign up, we might earn some money from it. If you do click through, we really appreciate it! Any money we make keeps this site running smoothly and allows us to continue writing these high-quality reviews. Chris Fong is a blogger and a 6 figure a year affiliate marketer. He enjoys helping others learn about different marketing tools and helping people achieve success online. I didn’t even realize just how much you kill the search space. Awesome man!